BRYOMONITOR is a computer program for biomonitoring disturbance and regeneration of neotropical rainforests using bryophytes as indicators. It has been developed using field data from Ecuador, Peru, Bolivia and Argentina and is designed for use in neotropical rainforests at altitudes of 0 up to 2000 m.
The objective was to develope a biomonitoring system that can be applied relatively easily and at a low cost in different parts of the Neotropics and allows the comparison of very different forest types. 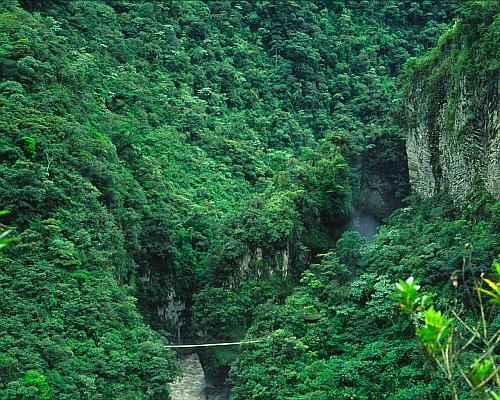 The program was developed in the course of the project „ Zonas de amortiguamiento como instrumento para manejar la biodiversidad en los bosques tropicales “ (Buffer zones as an instrument for sustainable use of rainforest biodiversity in three countries on the eastern slope of the Andes) financed by the European Community under the INCO-DC program (Contract number IC18CT980259). The program may be used and distributed free of any cost as long as it remains absolutely unchanged (see license agreement). All rights of the program are reserved by the author.